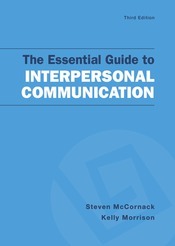 Steven McCornack, the award-winning teacher, noted scholar, and bestselling author, has done it again. 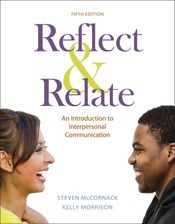 Interpersonal Communication and You maintains the best theory, up-to-date research, engaging examples, and personal voice seen in Reflect and Relate but with a new focus on student self-reflection, application, and adaptive learning. 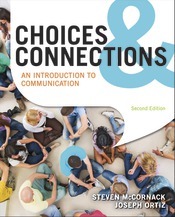 The compelling read is paired with a simplified feature program that prompts students to measure concepts against their personal experiences while encouraging them to build essential skills to further improve their interpersonal lives. 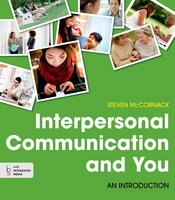 Interpersonal Communication and You is available in a variety of digital formats, including the brand-new, time-saving LaunchPad edition that combines an interactive e-book, LearningCurve adaptive quizzing, over 70 integrated video activities, and ready-made assessment options curated into easy-to-assign units inside one convenient learning program.